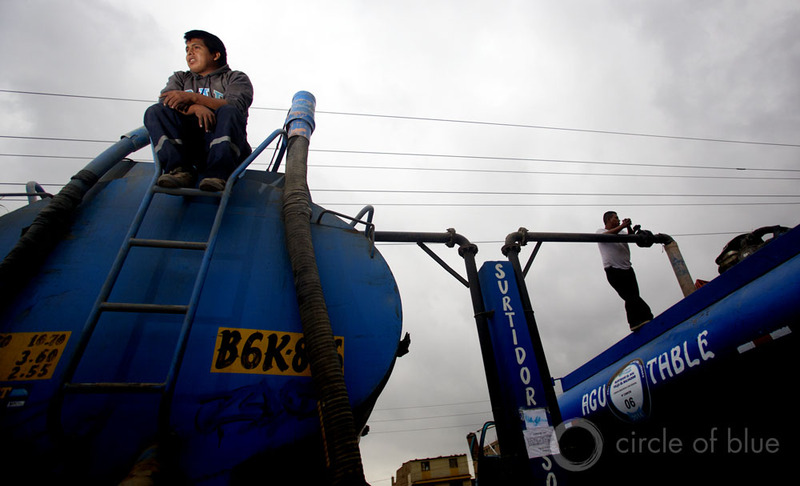 Ubiquitous water trucks are a guide to Peru’s swelling metropolis. Lima’s water trucks provide guides to understanding the circumstances affecting 21st century Peru, and to a larger extent the other fast-growing cities of Latin America. Municipal governments and taxpayers are not anxious to invest in water infrastructure to supply running water or sanitation services. As a result entire sections of the world’s cities do without. Water trucks dispense, at nominal or no charge, the essential resource that makes it possible for the world’s biggest cities — nearly all of them now in Latin America, Africa, and Asia — to keep expanding. Click image to enlarge. LIMA, Peru — Villa El Salvador is a section of this capital city of 9 million residents that lies between the Pacific Ocean and the coastal highlands. The community climbs up and rolls down steep slopes in a seemingly endless expanse of densely packed rooftops made of plastic, sheet metal, and wood. The unpaved streets, lined by the one-story walls of two-room homes, have no names. Still there is order and tidiness to Villa El Salvador, which numbers tens of thousands of residents. Bodegas offer snacks and boxed milk at many of the street corners. The crosses and monuments of a cemetery occupy a space as large as two soccer fields. Laundry dries in the breeze. Children dressed in black and gold school uniforms wait for school buses. And dawn breaks every morning with the muted light of the sun behind winter’s thick clouds and the sound of the honking horns of the city’s blue water trucks. The Villa El Salvador community of Lima climbs up and rolls down steep slopes in a seemingly endless expanse of densely packed rooftops made of plastic, sheet metal, and wood. The unpaved streets, lined by the one-story walls of two-room homes, have no names. Click image to enlarge. For a time in the 20th century, a good number of American families regularly received morning deliveries of milk and eggs at their back doors. The service defined two aspects of American life that are gone. The nation that emptied its cities to celebrate the new values of privacy and isolation in low density suburbs found in home delivery a fresh form of convenience. And homeowners in a nation that once developed sufficient wealth to enable one parent to stay home could afford such a luxury. The 21st century hasn’t been as kind. Home delivery in America now largely encompasses a mercantile space dominated by pizza and cable TV, which says more than we may want to know about the United States at this point. Lima’s water trucks also provide guides to understanding the circumstances affecting 21st century Peru, and to a larger extent the other fast-growing cities of Latin America. Municipal governments and taxpayers are not anxious to invest in water infrastructure to supply running water or sanitation services. As a result entire sections of the world’s cities do without. Water trucks dispense, at nominal or no charge, the essential resource that makes it possible for the world’s biggest cities — nearly all of them now in Latin America, Africa, and Asia — to keep expanding. In wet regions — Bombay, India; Bangkok, Thailand; Rio de Janeiro, Brazil — it’s a mess. Water trucks make their way through thick mud on unpaved streets. Raw waste runs in open channels because most big developing world cities don’t build sewage treatment plants or the transport infrastructure of pipes and pumping stations. One of the scarcest appliances in the world’s big developing cities now is a flush toilet. Here in Villa El Salvador, which was established over the last three decades, the situation with water is a little more tolerable. Water truck drivers sound their horns. Homeowners pop their heads into the street and signal with a wave that they need water. Young men, like 32-year-old Juan Carlos, hop off the back of the truck, shoulder a plastic hose, and top off the home’s plastic tank, which typically holds 1,100 liters (290 gallons). Juan Carlos told me he’s been at this for 10 years, a good municipal job that also provides him regular tips. 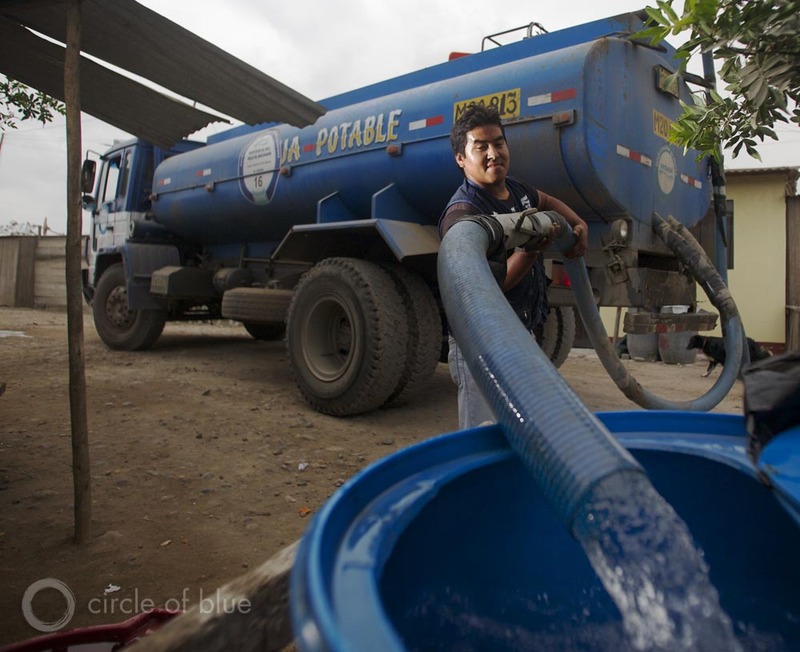 Juan Carlos, a 32-year-old municipal worker, fills his water truck at a water depot in south Lima. Almost a quarter of the city’s 9 million residents are served water by truçk deliveries. Click image to enlarge. Villa El Salvador residents told us they require a water delivery every four or five days. That amounts to roughly 50 gallons of water per home per day, or eight times less than the 400 gallons of water used daily in the average American household. Villa El Salvador residents also aren’t served by sanitary sewer lines so there are no flush toilets. The community doesn’t smell, though. 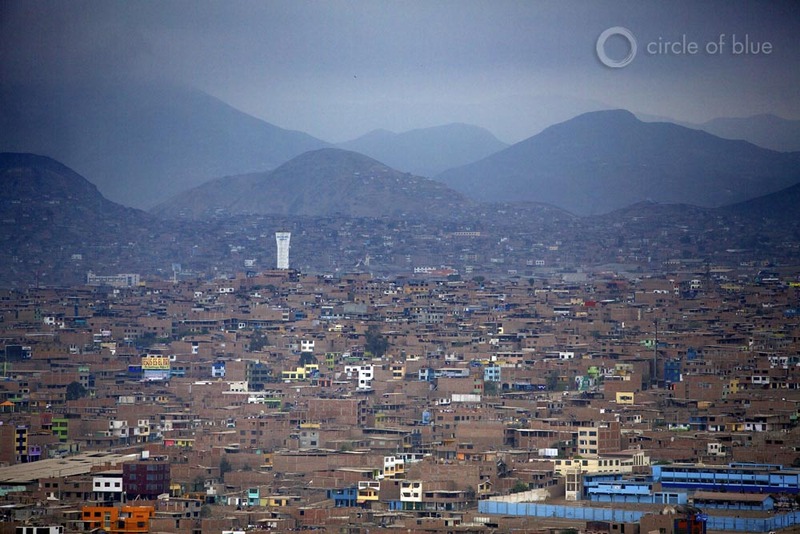 Lima was founded in 1535 on the dry desert bluffs alongside the Pacific and receives almost no rain each year. There is no standing water in Villa El Salvador, no open channels, no drainage ditches. That’s not to say there’s no problem. Waste disposal is carried out surreptitiously, a chore of daily life that no one wants to talk about, least of all municipal leaders. Lima operates a supply and treatment system that provides potable water that residents in the city’s established neighborhoods don’t trust. Upstream are mines and mineral processing sites that leach heavy metals into the three rivers that provide the city’s fresh water. Hotels and taxi drivers advise visitors to drink bottled water. The city’s sewage treatment system is similarly inadequate. Just a fifth of Lima’s wastewater is treated. The rest — eight of ten gallons — is flushed into the rivers and the Pacific. A school girl waits for the bus in Villa El Salvador, a section of Lima, the capital city of 9 million residents, that lies between the Pacific Ocean and the coastal highlands. Lima is growing by 200,000 new residents annually, with most of the increase coming in communities without running water or sewer services, like Villa El Salvador. Click image to enlarge. There are two especially discouraging facets about how Lima manages its water and wastewater. The first is that lack of service, a deficiency of water infrastructure, and polluted water is tolerated. The same attitudes exist in virtually all of the other big and developing cities that Circle of Blue has reported from in the last seven years — from Mexico City to Shanghai, Manila to Ulan Bator, from Delhi to Lima. The wealthier residents are served. The poor do without. Public health and water quality are at risk. The second is that laying water and sewer lines, providing safe drinking water, and treating wastewater is expensive, but not financially prohibitive. 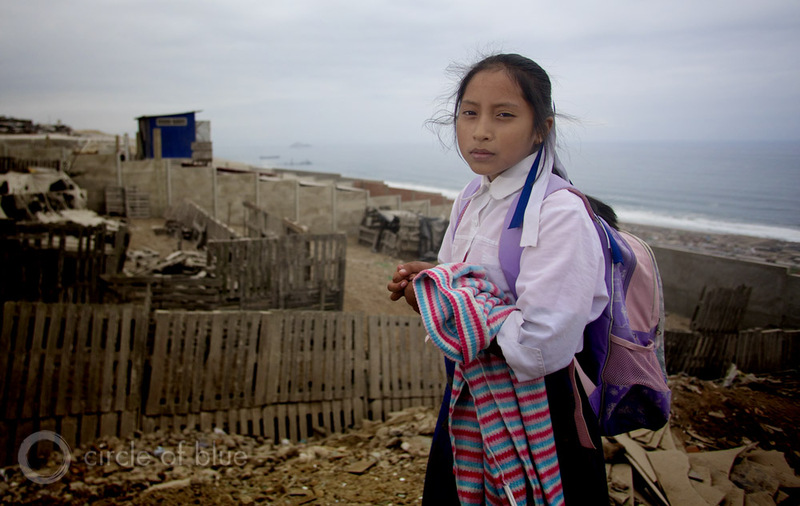 In the last decades of the 20th century Peru endured the collapse of its economy and an internal insurgency that led to an estimated 70,000 deaths. The 21st century, though, has been much better for Peru. Its mining sector, which accounts for over 60 percent of foreign trade revenue, is wealthy and growing. Its agriculture and tourism industries are strong. In other words Peru, a nation of 30 million people, and its capital city can afford to serve clean water to its people and treat their wastes.